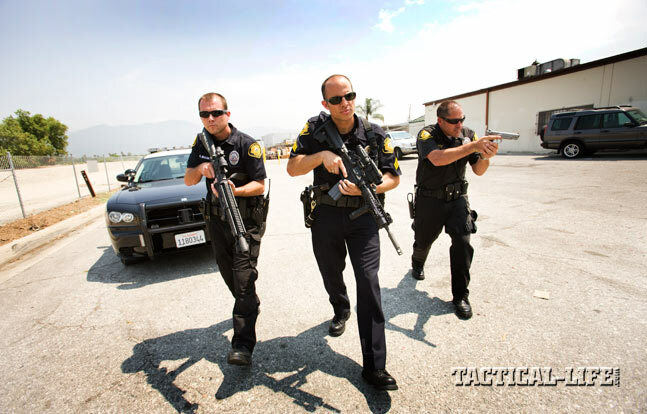 Advanced Law Enforcement Rapid Response Training (ALERRT) for countering deadly mass shootings! 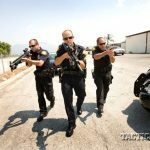 In active-shooter situations, rapidly entering the structure and engaging the threat is critical to stopping the violence. Officers with ALERRT training are fully prepared to respond. 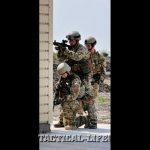 ALERRT courses teach officers to think and act quickly, understanding that there is more than one way to resolve the situation. 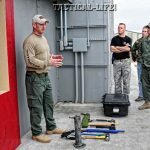 ALERRT’s “First Responder Breaching” course teaches LEOs to use both manual and ballistic breaching tools to gain entry. In Aurora, Colorado, a gunman entered a movie theater and shot at an audience, killing 12 and wounding dozens. These people were just there to see a movie. It was another tragedy inflicted by a psychopath. 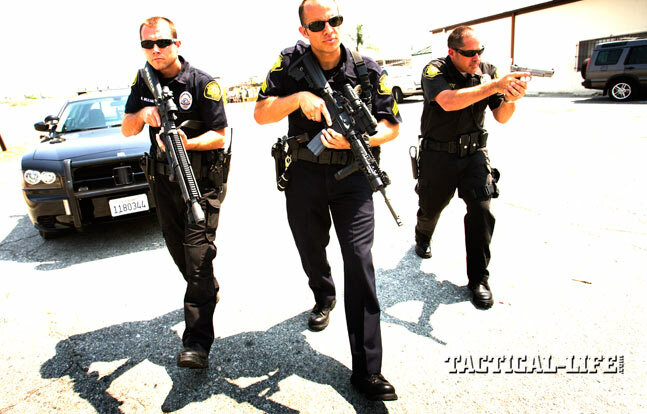 Since the Columbine shootings, law enforcement officers have had to plan and train for active-shooter situations. 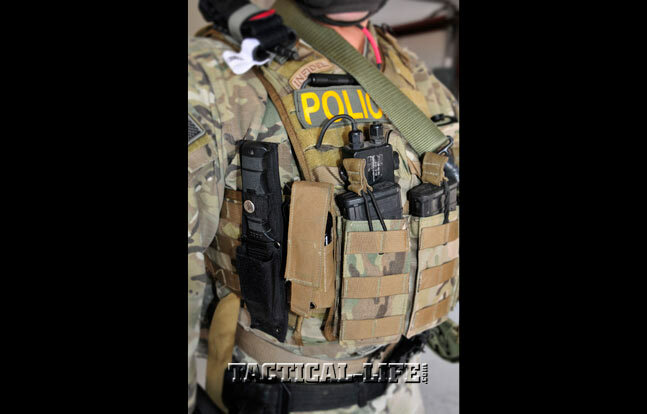 Each new incident provides a teaching opportunity, which refines law enforcement responses and tactics. In Aurora, the responding officers moved in quickly and, according to reports, handled the scene expertly. They had been trained to do so. What about other departments and officers faced with a similar tragedy? Would they be capable of an effective response? 1. Incidents of targeted violence at school are rarely sudden, impulsive acts. 2. Prior to most incidents, people had known about the attacker’s idea and/or plan to attack. 3. Most attackers did not threaten their targets directly prior to the attacks. 4. There is no accurate or useful profile of students who engaged in targeted violence. 5. 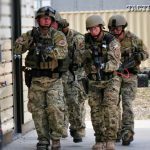 Prior to the incidents, most attackers engaged in behaviors that caused others concern or indicated a need for help. 6. Most attackers had difficulties coping with significant losses or personal failures, and many had considered or attempted suicide. 7. Many attackers felt bullied, persecuted or injured by others prior to the attacks. 8. 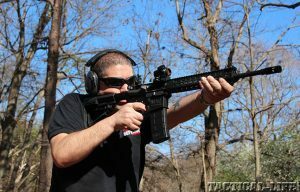 Prior to the attacks, most attackers had access to and had used weapons. 9. In many cases, other students were involved in some capacity. 10. Despite prompt responses by law enforcement, most incidents were stopped by means other than law enforcement intervention. 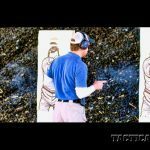 Although the study was specific to school shootings, the above findings can describe any active shooter. 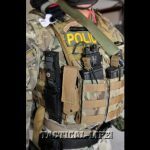 For law enforcement agencies, it is almost impossible to anticipate an act of targeted violence—they cannot patrol or investigate it until it has occurred. 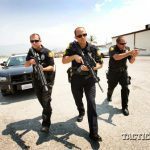 The only real answer is for law enforcement to train and prepare to stop the deadly threat, minimize the damage and rescue the victims. 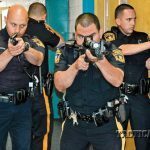 In the aftermath of the Columbine High School attacks, some local officers in San Marcos, Texas, got together and decided that active-shooter-response training needed to be standardized and available to all law enforcement. 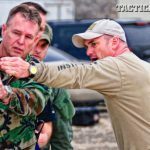 Terry Nichols, a retired San Marcos officer and now the deputy director of training for the Advanced Law Enforcement Rapid Response Training (ALERRT) Center, said, “We felt all officers should be trained and ready to respond, and that a standard curriculum needed to be developed and taught. That was the origins of ALERRT.” To address that need, in 2002 the ALERRT Center at Texas State University was created as a partnership between the Texas State University, the San Marcos Police Department and the Hays County Sheriff’s Office. 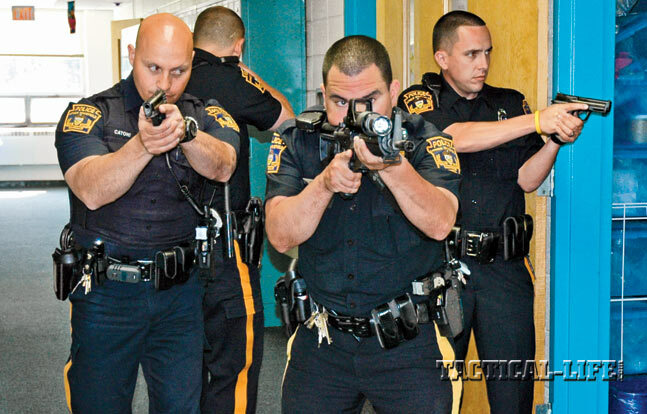 Over the last 12 years and with a little over $30 million in state and federal grant funding, the ALERRT Center has trained more than 50,000 police officers from around the nation in dynamic, force-on-force, scenario-based active-shooter training. 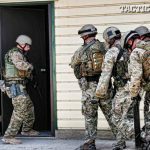 ALERRT has become the national standard that U.S. law enforcement agencies strive for, and it’s funded by grants from the Bureau of Justice Assistance (BJA) and the Texas Governor’s Office Criminal Justice Division. 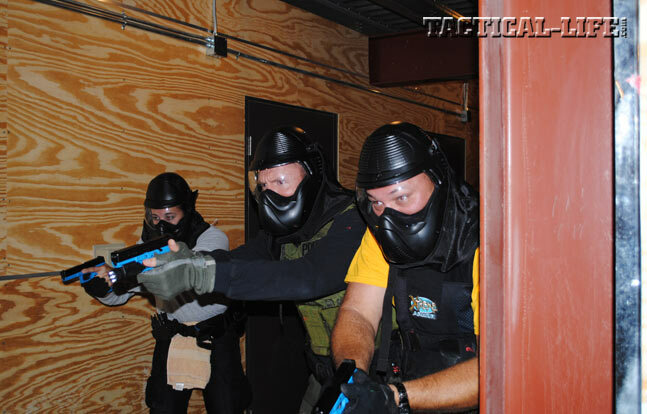 The training is free to law enforcement officers and agencies. 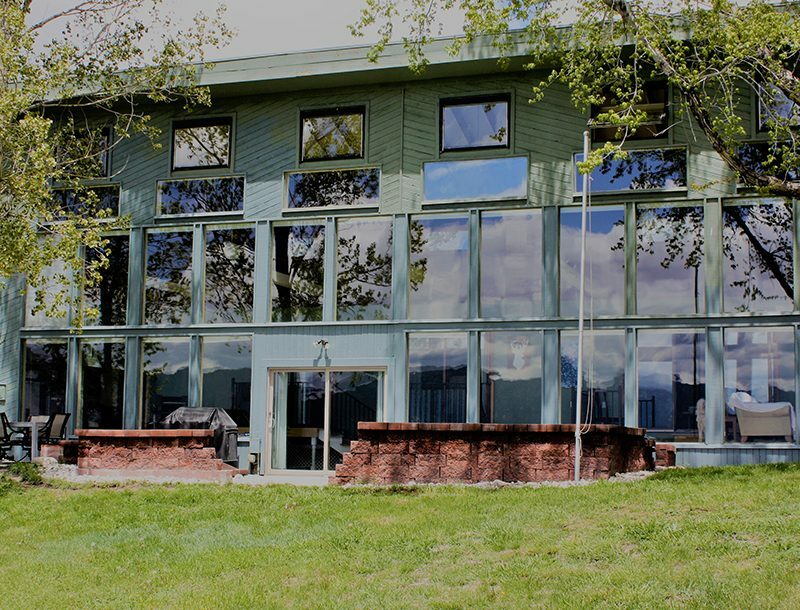 However, funding for the courses is limited. The ALERRT Center has developed and currently delivers seven grant-funded first-responder courses across the nation. 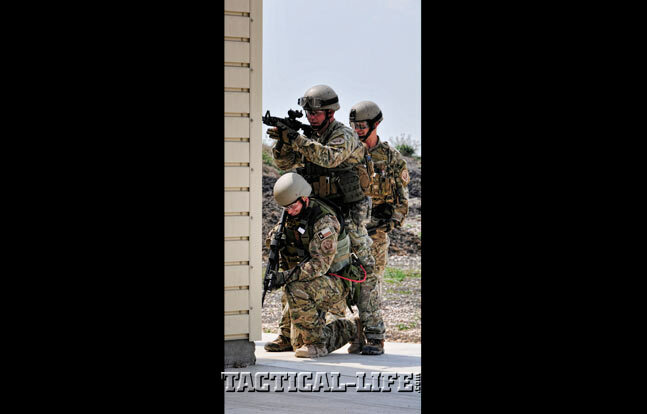 Basic Active Shooter Level I: This dynamic course of instruction prepares the first responder for isolating, distracting and neutralizing an active shooter. 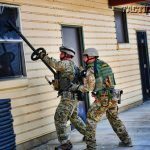 This course covers shooting and moving, threshold evaluation, concepts and principles of team movement, the setup and techniques used for room entry, approach and breaching the crisis site, rescue-team tactics, improvised explosive devices and post-engagement work priorities. 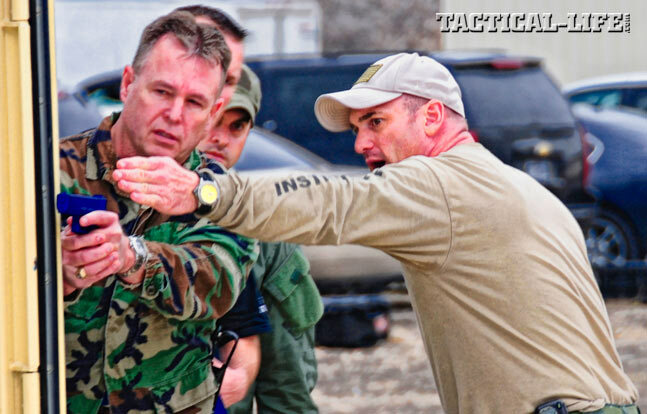 The course culminates with dynamic force-on-force scenarios. 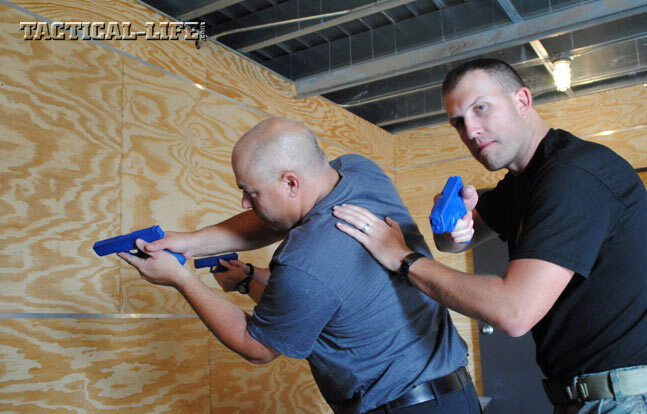 Active Shooter Level II: Day one includes self-aid and buddy-aid techniques, and day two includes force-on-force mass-casualty scenarios where the student will not only have to neutralize the gunman but also treat the wounded. 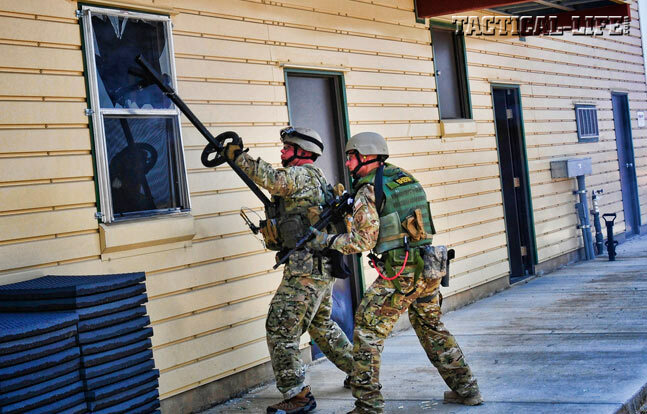 Exterior Response to Active Shooter Events (ERASE): The ERASE course was originally designed to assist rural law enforcement officers working along the volatile Southern U.S./Mexican border, but over the years it has proven beneficial for officers from any locale. 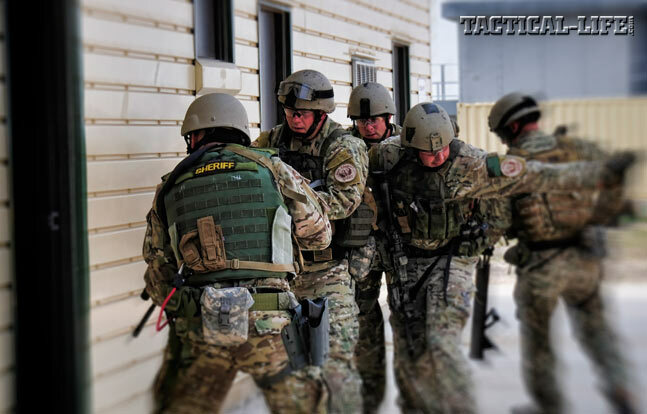 This hands-on course covers equipment selection, vehicle ambushes, medical emergencies, mounted and dismounted officer-/citizen-down rescue, dismounted individual-movement techniques, dismounted team-movement techniques and hasty vehicle assaults. 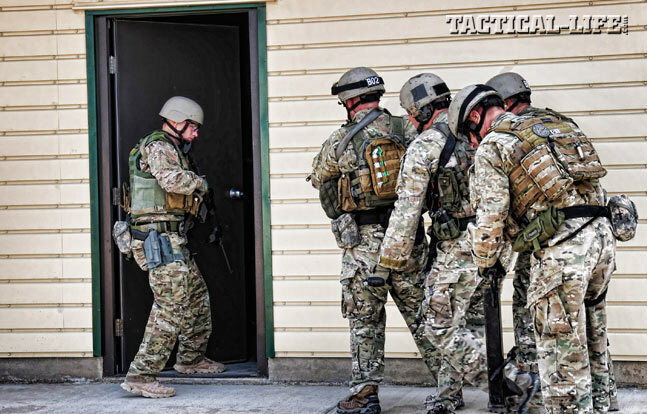 First Responder Breaching: This course covers the use of both manual and ballistic breaching tools to gain entry into a structure under extreme exigent circumstances that demand immediate entry to save and protect innocent lives. 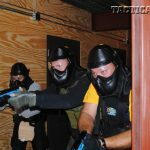 First Responders Operating in Low-Light Conditions: This course incorporates the use of force-on-force drills to validate the tactics and techniques of low-light operations. 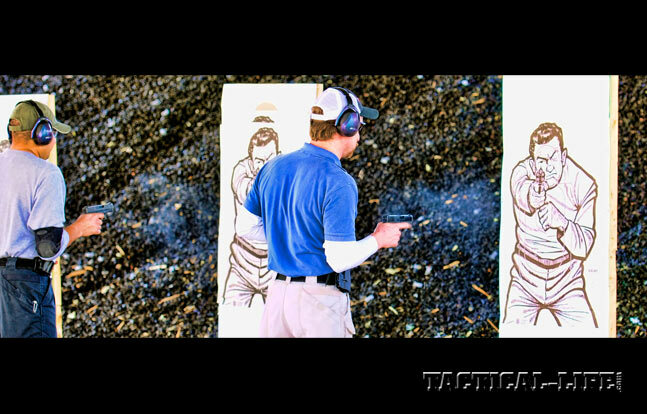 Topics center on approaching a target area, low-light searching techniques, low-light entry methods, armed confrontations and unarmed suspect handling. 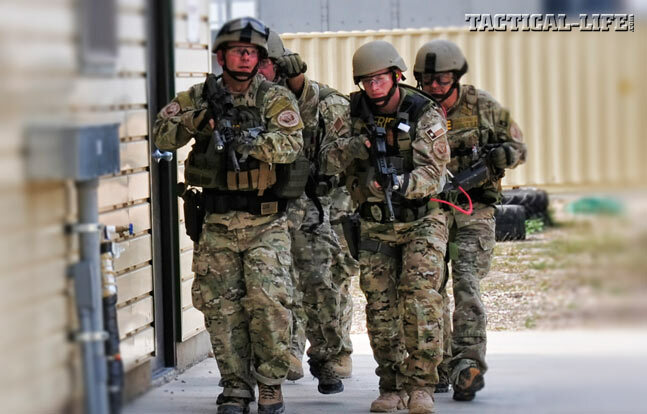 Active Shooter Train-the-Trainer: This course, taught by four senior instructors from the ALERRT training team, will train a select group of 25 law enforcement officers who are experienced in police training. 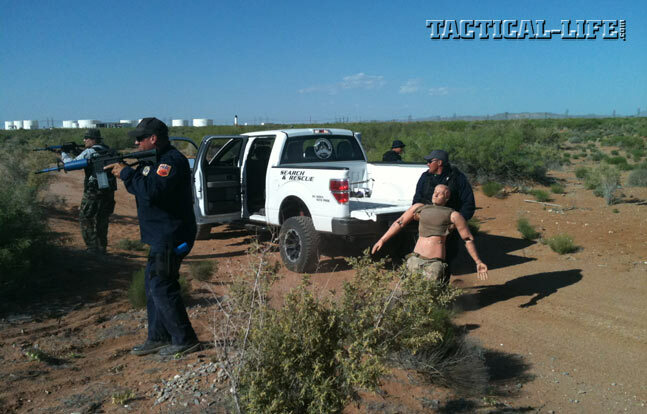 During the first two days, participants complete the 16-hour basic active-shooter course. 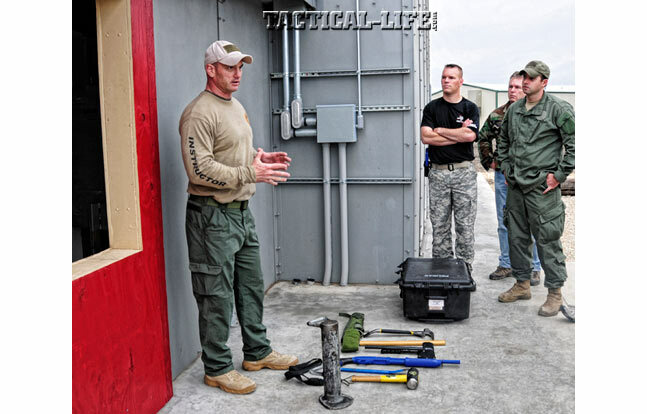 The third day is devoted to teaching methods and instructor training. The fourth and fifth days are focused on teach-backs, remediation and evaluation of the participants. According to Terry Nichols, the Aurora incident drives home the need to train today’s first responders in medical response and triage. Most shooting rampages end quickly: At Virginia Tech University, it took the shooter just nine minutes to shoot 170 rounds and kill 30 people. The more prepared law enforcement can be for the shooting’s aftermath, Nichols says, the less lives may be lost. 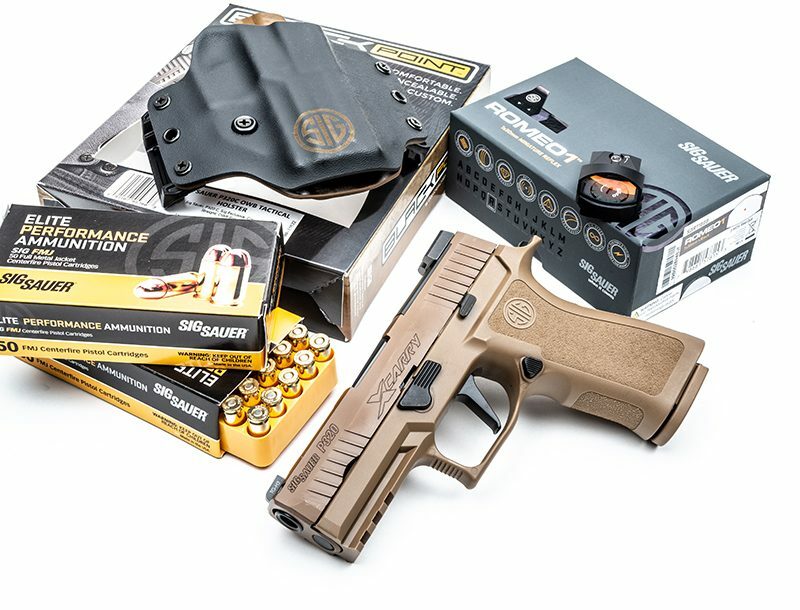 In a mass shooting there will be many victims with traumatic injuries, as well as a need to prioritize victims and administer advanced first aid. “We have become really good at getting cops in the door fast and stopping the violence,” Nichols emphasizes. He’s quick to credit Aurora officers for their quick thinking and handling of medical emergencies at the cinema, but he notes, “As a profession, we’re not doing as well as we should at stopping the dying.” He states that, in active-shooter situations, formally trained medical personnel are often unable to immediately reach the scene and provide casualty care. 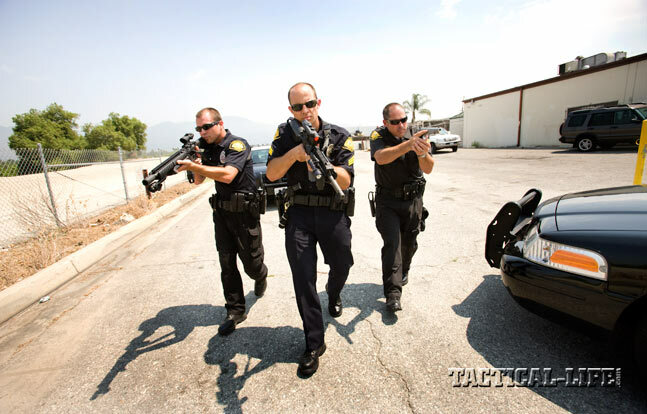 Thus, responding officers must be educated and trained in immediate casualty-care techniques to help save lives. 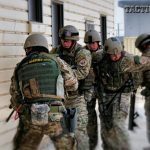 ALERRT active-shooter training has been provided to officers in Alabama, Iowa, Louisiana, Mississippi, New York, Oklahoma, Texas and Virginia, to name a few, and includes the police departments of New York City, Dallas, Houston, San Antonio and Atlanta. For more information, visit alerrt.org.